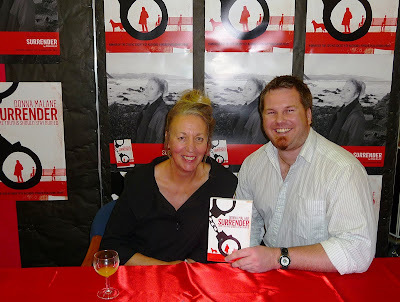 Last night I was fortunate enough to attend the official Auckland launch of SURRENDER, the debut crime thriller from Wellington writer Donna Malane that earlier this year won the inaugural NZSA Pindar Publishing Prize (see picture above). As I noted back in June, Wellington screenwriter and producer Malane (Until Proven Innocent, Duggan, Blood Lines, The Insider's Guide to Love, The Strip, etc) rose to the top of more than 500 entries to by win the NZSA Pindar Publishing Prize - which was open to writing in any genre, including non-fiction and poetry and short story collections - for her then unpublished thriller about a woman delving into the seadier side of Wellington while she looks into the deaths of her sister, and the man she'd suspected of killing her. SURRENDER has now been in Whitcoulls and Borders stores for a week now, and I've perosnally seen a fair few copies being sold while I've been browsing the past few days, so hopefully it will hit the New Zealand Adult Fiction bestseller list next week, and plenty of Kiwis will give it a go as the publicity and word of mouth starts to roll out in the coming days and weeks. I read an advance copy of the novel a fortnight ago, and really enjoyed it, finding it more and more absorbing as it went on. I understand my review of SURRENDER is scheduled to be published in the Canvas magazine of tomorrow's Weekend Herald, so I will republish that review for you all here early next week (and/or link to the Herald's website if they place the review online). I also have Sarah Gumbley reviewing SURRENDER for Crime Watch (since I've reviewed the book for the Herald), and her review will be published here in the coming days also. And remember, to get the award-winning novel for only NZD$10, half price – simply clip the voucher printed in The New Zealand Herald between 16 September and 16 October 2010 and take this to a Whitcoulls or Borders store nationwide (example above). Offer available while stocks last. Kudos to the New Zealand Society of Authors, Pindar Publishing, the New Zealand Herald, Red Group (who own Whitcoulls and Borders), Astra Print, and Creative New Zealand, who all came together to make the inaugural prize possible. Hopefully the readers will give the winning book a go, thereby encouraging them all to run the Prize again in future. It's a great way for talented 'undiscovered' novelists and writers to have an opportunity of breaking into the publishing world. If Malane's debut adult thriller is anything to go by, there is plenty of talent out there worthy of being published and read. What do you think of 'unpublished' writer competitions and prizes? Do you like the sound of SURRENDER? Will you be giving it a go? Have you watched any of Malane's TV productions (you can read my review of Until Proven Innocent here)? Thoughts and comments welcome.